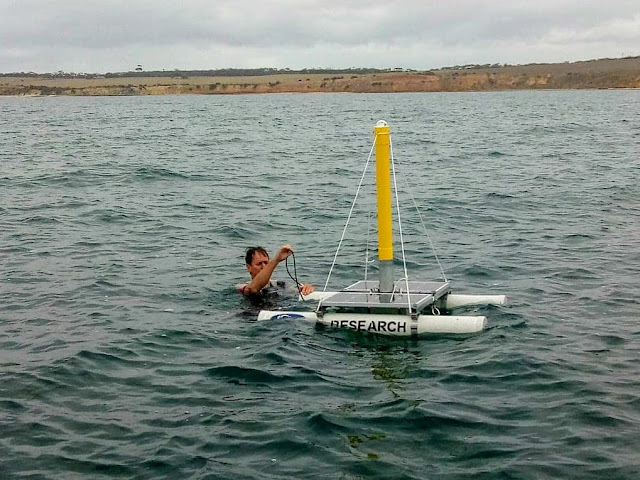 One of AusOcean's goals is to dramatically lower the cost of ocean monitoring. One way we're doing this is by using low-cost consumer electronics and another way is by getting creative with our use of low-cost materials. One of our top priorities is continuous underwater video monitoring. Continuous monitoring rules out the use of cameras that store video locally, i.e., to an SD card, such as a GoPro. Instead, we require so-called IP cameras, which can stream video over networks. Such cameras are becoming common for surveillance applications, but good ones typically cost at least US $200 (usually more), and underwater housings typically add hundreds or even thousands of dollars to the cost. We decided to build our own by combining a Raspberry Pi 3 (US $35) with a Pi Camera (US $30) (top photo). The Pi 3 provides Ethernet connectivity and the compute power for the Pi Camera. In fact, a Pi Zero, which costs less than half as much as a Pi 3, is more than up to the task of processing video, but lacks built-in Ethernet connectivity. Why Ethernet? Because our cameras are going under water where WiFi does not work! Also, we need to supply power to the camera. By using passive Power over Ethernet (PoE), we combine a 24V DC power supply with data over a single Cat 6 waterproof cable. The final hardware component is a (US$5) voltage regulator, which steps the 24V DC down to 5V DC to power the electronics. The electronics sits on a custom semi-cylindrical mount that we 3D printed. 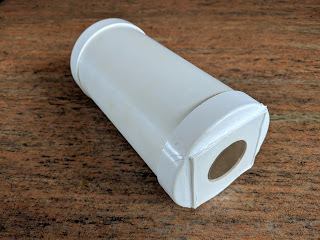 The housing is made from 90mm PVC tube and slide-on caps available from any hardware store, glued on with PVC glue. The viewing window is made from a 32mm (1 ¼") diameter hole covered with a 60mm acrylic square, glued on with acrylic glue (shown below). The Ethernet cable is permanently glued ("potted") to the other end using JB Weld and Sikaflex 291 (not shown). 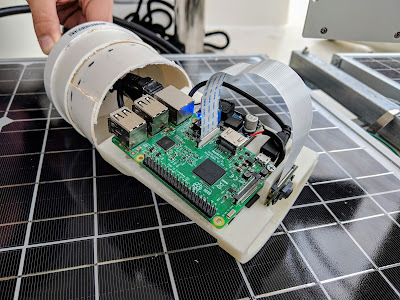 On the software side we developed revid which takes raspivid output from the Pi Camera and streams it to the cloud or YouTube. Based on earlier testing, we expect this PVC housing can easily withstand pressures of 3 atmospheres (20m depth), but we only plan to deploy to a depth of 10m. We stress tested the housing by towing it behind a boat at 7 knots for half an hour, and there was no sign of water ingress. We will publish the detailed assembly steps later, as we're still tweaking things. AusOcean's mission is to help our oceans through the use of technology. One way we're achieving that is with software, and "open-source software" in particular. If you're not familiar with the term, there is a good Wikipedia article. In a nutshell, open-source software right holders grant others the rights to study, change, and distribute the software with few restrictions. 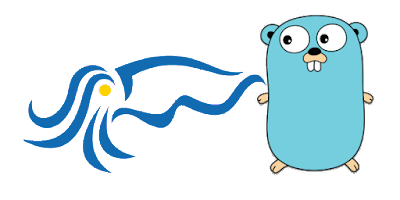 Using open-source software means we don't have to re-invent the proverbial wheel all the time. We also need to develop new software, which AusOcean is making available under a type of open-source license known as the GNU General Public License (GPL). Last week we revisited Windara Reef to deploy the latest version of our rig, Rig #3 shown above. Unlike the previous version (Rig #2), the rig's bright yellow "mast" is now a uniform 90mm diameter tube, providing more generous internal space than its predecessor. Battery capacity has also been upgraded from 20Ah to 28Ah, enough to fully power the rig for two days without any solar power. This version also includes two cameras, one on the surface and one under water. For now, the underwater camera is suspended in mid-water 7m (23') below the rig, pointed down at approximately 45°. On a future trip we'll mount it to an underwater tripod, but, for now, this camera is very easy to maintain. Simply raise it to the surface, wipe the viewing window clean, and re-lower it.